Are you looking to find the best spikeless golf shoes for yourself? Did you know that spikeless golf shoes is the new fad and almost every major footwear brand offers some kind of spikeless golf shoes now. Instead of hard metal or plastic spikes, spikeless shoes use small nubs or cleats molded right into the sole of the shoe. 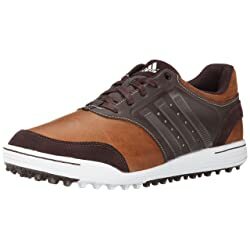 A few years ago golf shoes without replaceable spikes wasn’t even a trend and barely accounted for 10 percent of the total golf shoe sales. At this point in time the game is totally different, the trend has caught on as they’re maintenance free, look great, weigh lighter, feel comfortable and offer all the traction you need from a golf shoe! The FootJoy Contour Casual Spikeless Golf Shoe ranks # 1 in our list of best spikeless golf shoes. This shoe from footjoy is a class apart as it is made of high quality soft grain leather and comes with a waterproof warranty for one year. The shoes is light weight and the cushioned fit bed provides extreme underfoot comfort and heel support. The outer sole is made of rubber called “DuraMax” which is a proprietary compound that provides extreme grip on the turf with performance and durability. This proprietary technology from FJ’s definitely makes your walk easier on the course and offers unmatched stability during your golf swings – thereby making it an ultimate combination of comfort and performance. The Adidas Men’s adicross III Golf Shoe ranks # 2 in our list of best spikeless golf shoes. You can opt for this one if you’re looking for a shoe that you can use on-course and off-course. 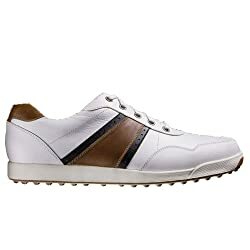 It looks like a smart casual golf shoe and its got a style that can be used almost anywhere. You can head in for a drink with your friends right after your game and you would definitely not feel out of place. It comes with a water resistant upper and the abrasion resistant rubber outsole offers versatile spikeless traction – which utilizes 100 strategically placed traction lugs in varying sizes for ultimate traction and grip in all weather conditions.The shoes are manmade, lightweight and very comfortable. These shoes also size a bit smaller than expected, so make sure you buy 1/2 size larger than usual. 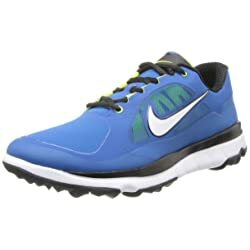 The Nike Golf Men’s F1 impact ranks # 3 in our list of best spikeless golf shoes. This shoe is made from imported synthetic material and comes with a synthetic sole. The breathable mesh ensures enough air-flow during the summers. The free-inspired outsole with flex grooves and rubber traction pods offers great traction during your play. The shoe feels extremely comfortable and is well cushioned. It actually makes you feel like you’re walking on a cushion of air. These shoe also tend to fit a bit tighter than normal, so make sure to order a 1/2 size up. All in all an excellent looking shoe that offers comfort and good traction during play. These shoes also size a bit smaller than expected, so make sure you buy 1/2 size larger than usual. 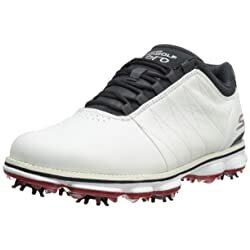 The Skechers performance Men’s go Golf Pro Shoe ranks # 4 in our list of best spikeless golf shoes. The shoe definitely goes ahead to fuse fashion and function into one package. The upper-sole is made from leather material. Comes with a very wide tongue and would be preferable by users who have a wide feet. It’s a water resistant shoe and does a pretty good job of keeping your feet dry in extreme wet conditions. The shoe comes with a resalyte midsole that makes it extremely comfortable during play. The shoe offers great amount of traction during play because of its TPU outsole plate. One of the good things about this shoe is that you may not need to “break in” and is comfortable from the 1st use. This shoe comes in a variety of colors to suit your styling requirements. The Puma Men’s Faas Lite Golf Shoe ranks # 5 in our list of best spikeless golf shoes. 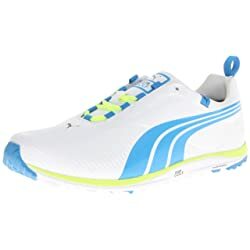 The Puma Men’s Faas Lite is an extremely stylish shoe that is made from microfiber waterproof leather and comes with a EverTrack carbon rubber sole. Living up to it’s name it is an extremely lightweight, flexible and comfortable shoe. The smart quill traction technology on the outsole offer super ground contact which provides extreme grip and flexibility during your play. One thing that you will not miss is that it’s extremely light weight – may be even lighter than your slippers or sandals. They will fit like a glove on your feet and provide you the traction you need for an excellent game. These shoes run a hair small and it may be prudent to order 1/2 size larger than your usual shoe.